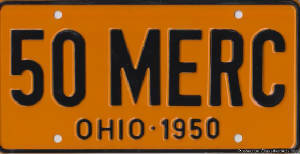 1950 Ohio license plate pair. Number '50 Merc' . Original yellow and black color. Just like new, no bends, dents, chips or rust. Always ran with clear covers.